High – Low audible & visual alarms. 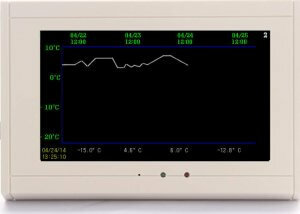 The TV2 Master Thermometer alarms, monitors, logs and charts four environmental conditions. Sensors to monitor temperature, relative humidity and differential pressure can be mixed and matched in any combination. Each monitor can be configured to use remote wired or wireless sensors. Each sensor stores over 80,000 data points in non-volatile memory in the monitor itself. 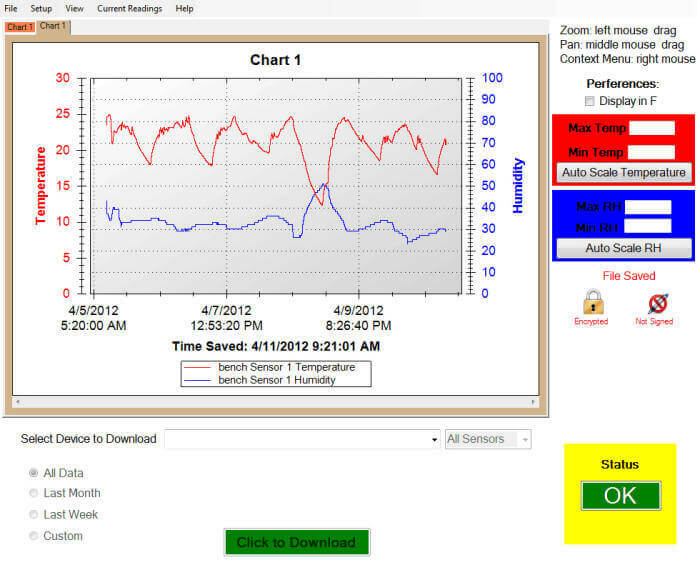 Any sensors logged data can be viewed on the monitor as well as downloaded to a PC with the free TView software. The chart can be scrolled through, and expanded to show a year of data or compressed to show individual logged data points. The monitor can be interfaced with a PC on the same Local Area Network so logged data is automatically copied to the network. This also facilitates Text, Email or Phone call alerts. Because of the way the data is displayed, trends can be spotted and individual data points can be examined. The display has no moving parts, requires no paper, pens or ongoing maintenance. It incorporates the best features of chart recorders and data loggers. It’s Easy-Touch™display makes it easy to install and use. Like a chart recorder it samples and displays temperature data, but unlike a chart recorder it stores months and even years of temperature history, does not require a paper chart, pen or a staff member to change the chart. 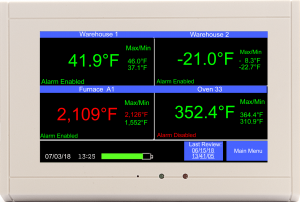 Like a data logger it continually samples and stores temperature data, but unlike a data logger it does not require a computer to setup or view the data. The TV2 monitor can be added to a Local Area Network with a CAT 5 cable. Once it is a part of the network the current conditions and the logged data can be accessed with any PC on the network. A special feature of the free TView PC software makes it possible for all data to be copied to files on a computer and text or email alerts sent over the internet if an alarm occurs. Power out alarms as well as high-low alarms for each sensor are set on the monitor and ensure that if any condition becomes unsafe, the user is immediately notified.